Cooked rice mixed with sweet sushi-vinegar in which sugar and salt are added. In sushi term it is called “Shari”. Prior to WWII, there were chefs whose only job was making vinegar rice! From the end of the Edo period through the Meiji period, rice was cooked using firewood and a pot. It is not easy to get the fire at the right temperature and the rice has to be cooked to the same texture regardless of where it came from or the size of the grains, so at the time the task required a skilled chef. Therefore, there were “Shari-ya” employed by sushi restaurants who specialized in cooking rice. “Shari-ya” focused on this single task and were not involved in the actual making of the sushi after the rice was passed on to the chefs. Posted on January 29, 2018 September 11, 2018 Categories TriviaTags Edomae Shigoto, Edomaesushi, Shari, vinegared riceLeave a comment on Prior to WWII, there were chefs whose only job was making vinegar rice! The real way of making shari (vinegared rice) by a sushi master. There are 4 tips! In order to bring sushi to life, it is extremely important how shari is made. Let me introduce a cooking method, a top grade sushi master uses. First, wash the rice gently. Leave it to soak for about half an hour and let it fully absorb water. The first tip is to keep the water level of the rice even in this way. The rice should be cooked with water with a ratio of 10 to 9. A little less water than the regular rice, so that it is cooked slightly hard. This is the second tip. While you wait for the rice to cook, make awasezu* by adding salt and sugar in vinegar. Also, set up hangiri (rice-cooling tub) for mixing the rice. Don’t forget to wipe the inside with a wet kitchen towel to prevent the rice from sticking to it. Once the rice has finished cooking, leave it to steam for about 15 minutes and dump it out into hangiri. Pour awasezu immediately and let it sit for 30 seconds or so. Because the rice absorbs vinegar only while it is hot, managing this process quickly is the third tip. After letting it sit for 30 seconds, spread the rice out with shamoji (rice spatula) as if cutting it down. Make sure that vinegar goes around using a cutting motion vertically. Additionally, fan the rice using a uchiwa (fan) to remove the moisture of vinegar and mix the rice with a cutting motion horizontally this time. Fanning with uchiwa is not to cool down the rice (Do not put the rice in the fridge to cool it down. ), but to dry up the excess moisture of vinegar. Moving both hands as you consider it is the fourth tip. After the rice is vinegared evenly, assemble it in one place and cover it with a damp kitchen towel. In about an hour, it is ready when shari is settled. (Body temperature) Even in a hurry, if you don’t give at least 30 minutes, it won’t help the taste of course, and also won’t make it easy to form the rice for sushi. If you rush at the end, all the delicate attention up to this will be in vain. *A professional recipe for awasezu is as follows. This is a recipe for short grain rice species such as Koshihikari and Sasanishiki. 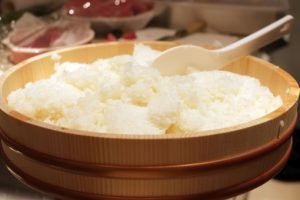 Slightly sticky rice like calrose is not suitable for sushi rice. Posted on May 15, 2017 September 12, 2018 Categories TriviaTags Edomae Shigoto, Nigiri sushi, Recipe, Sushi Glossary, Sushi Ingredients, Sushi roll, vinegared rice2 Comments on The real way of making shari (vinegared rice) by a sushi master. There are 4 tips!